Michael Kassner, a freelance writer, wrote a very interesting article published at TechRepublic on how microfluidic cooling might be the answer to preventing Moore’s Law from petering out. Moore’s Law is the observation made in 1965 by Gordon Moore, co-founder of Intel, that the number of transistors per square inch on integrated circuits had doubled every year since the integrated circuit was invented and would continue for the foreseeable future. However, Moore’s Law is under threat because existing technology is not able to keep microchips cool while still adding more processing power. ICECool is exploring disruptive thermal technologies that will mitigate thermal limitations on the operation of military electronic systems, while significantly reducing size, weight, and power consumption (SWaP). The specific goal of ICECool Applications is to enhance the performance of RF power amplifiers and embedded computing systems through the application of chip-level heat removal with kW-level heat flux and heat density with thermal control of local submillimeter hot spots, while maintaining these components in their commonly-accepted temperature range by judicious combination of intra- and/or interchip microfluidic cooling and on-chip thermal interconnects. Phase I of the ICECool program verified the effectiveness of Lockheed’s embedded microfluidic cooling approach by demonstrating a four-times reduction in thermal resistance while cooling a thermal demonstration die dissipating 1 kW/cm2 die-level heat flux with multiple local 30 kW/cm2 hot spots. This is about four to five times more heat per unit area than most current chips dissipate, paving the way for future chip advancements. In Phase II of the program, the team has moved on to cooling high power RF amplifiers to validate the electrical performance improvements enabled by improved thermal management. Utilizing its ICECool technology, the team has been able to demonstrate greater than six times increase in RF output power from a given amplifier, while still running cooler than its conventionally cooled counterpart. In its ongoing effort to move the technology out of the laboratory and into the field, Lockheed Martin is developing a fully functional, microfluidically cooled, transmit antenna prototype to increase the technology readiness level (TRL) of this technology. 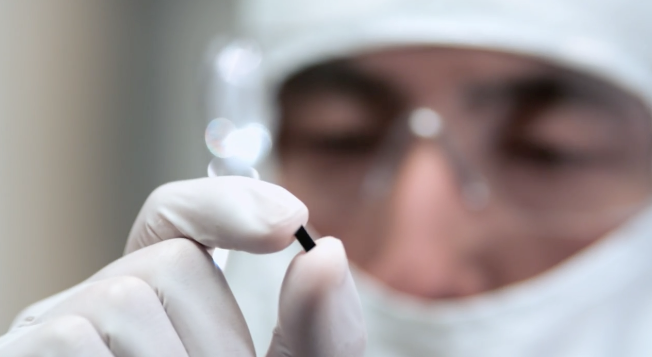 This will lay the foundation for possible insertions into future electronics systems. Lockheed Martin is working with Qorvo to integrate its thermal solution with Qorvo’s high performance GaN process; a relationship that will help unleash the full potential of GaN semiconductors by removing current thermal barriers. The Lockheed Martin approach is also applicable to other current and future die technologies, such as existing Gallium Arsenide (GaAs) and future GaN on Diamond when it becomes available. Lockheed Martin’s ICECool embedded thermal management approach removes thermal barriers to harness GaN’s full RF power handling capability. In addition to revolutionizing the way GaN amplifiers are implemented, this technology will benefit any high heat flux Integrated circuit application, including signal processing and high performance computing.